For the final time at Fenway Park during the regular season, the Yankees and Red Sox renew hostilities in a three-game series that begins tonight. If the Bronx Bombers hope to finally get the better of their rival, winning game one will be paramount. In the opener, the pitching matchup of CC Sabathia vs. John Lackey favors the Yankees, but in the subsequent games, the Red Sox enjoy a decided advantage. With Boston’s pair of aces, Josh Beckett and Jon Lester, facing New York’s struggling tandem, Phil Hughes and A.J. Burnett, the onus is on Sabathia to get the Yankees off on the right foot. Can Sabathia wipe away his earlier season struggles against Boston (Photo: AP)? Of course, the Red Sox might not look at game one as much of a mismatch. 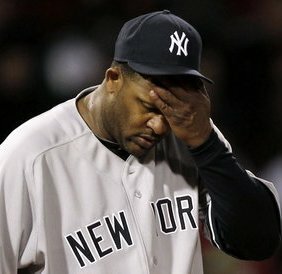 Despite compiling a 17-3 record with a 2.40 ERA against the rest of the league, Sabathia has been unable to beat Boston. In his four starts against the Red Sox, the Yankees’ ace lefty is 0-4 with an ERA of 7.20, so you can’t blame the Boston lineup if it enters tonight’s game with supreme confidence. Considering how well he has pitched against every other team, it stands to reason that Sabathia will eventually turn in a strong outing against the Red Sox. At the very least, history should be on his side. Since 1919, only eight Yankees’ starters (in nine seasons) have lost five games against one team in a single season, and only three have done it without recording a victory. So, not only is Sabathia pitching to keep the Yankees alive in the divisional race, he is also trying to avoid making an ignominious mark on franchise history. Because of the mismatches the Yankees will face in the last two games of the series, Sabathia’s start looms as large as the man himself. Regardless of the outcome, the Yankees will be greeted by the foreboding presence of Josh Beckett in game two. Although Beckett’s 2.43 ERA against the entire league is impressive enough, it actually pales in comparison to the three runs he has allowed to the Yankees in 27 innings. Over his four starts against New York, including three showdowns with Sabathia, Beckett has been nothing less than dominant, which, considering his 2:1 strikeout-to-hit ratio, is still an understatement. If Beckett notches his fourth victory against the Yankees, he would become only the fifth pitcher in the last 25 years to go undefeated against the Bronx Bombers in at least four decisions. What’s more, the Boston right hander has been so tough on the Yankees this season, simply scoring a run might be asking a lot. To date, Beckett’s miniscule ERA of 1.00 against the Yankees stands as the 12th lowest season rate among all pitchers who have thrown at least 27 innings against the team. Needless to say, if Beckett is on his game, the Yankees will need something resembling a career-best performance from Hughes in order to prevent the Red Sox ace from making history at their expense. The third game of the series features another lopsided pairing as Jon Lester, who is 3-0 with a 1.42 ERA in his last three starts, faces A.J. Burnett, who has an eye popping 11.91 ERA in his last five starts. Although neither pitcher is on the verge of a single season milestone or low point against the other team, Burnett promises to continue his assault on several franchise benchmarks for futility. In order to gain ground in the division and finally win a series against the Red Sox, the Yankees will need history to take a back seat. Otherwise, their chances of catching Boston will likely follow close behind. Click to check out my latest post at Bronx Banter - "Saving the Best for Last"